This tutorial will give you a framework for understanding the important role of analysis in human-centered design and teach 4 key methods for practicing analysis. The framework proposes a model for selecting and utilizing specific methods that are either top-down or bottom-up, and are practiced in groups or by individuals—but it also stresses importance of creativity, as no linear process will always guarantee meaningful insights. The framework is also a mechanism to help stakeholders understand the outputs from analysis, and enable them to evaluate findings as part of the big picture, rather than just ingesting “the answer.” The ambiguity that accompanies analysis and synthesis can be concerning to extended team members and stakeholders. Engaged stakeholders often want early insights from the field, even hours after an interview concludes. The framework offered in this tutorial will: 1) help stakeholders understand the iterative nature of analysis and 2) define ways in which you can involve stakeholders in your analysis. To make tangible our recommended key framework for successful analysis, attendees were asked to conduct observational research and/or user interviews regarding the travel experience as they traveled to Montreal. This data collection pre-task allowed us to practice various data analysis methods together during the tutorial. After the presentation and break-out analysis sessions, Carey and JoEllen shared a case study from a recent Northern Lab project. The video includes only the presentation portion of the tutorial. Carey Palmer is an experience design lead at The Northern Lab, an enterprise-wide incubator for Northern Trust, tasked with identifying, prototyping and designing innovative experiences for clients and partners. She spent 8 years prior as a consultant at gravitytank, then dscout mobile research, working across industries including digital technology, consumer electronics, food and beverage, and consumer packaged goods. Carey has a B.I.D. 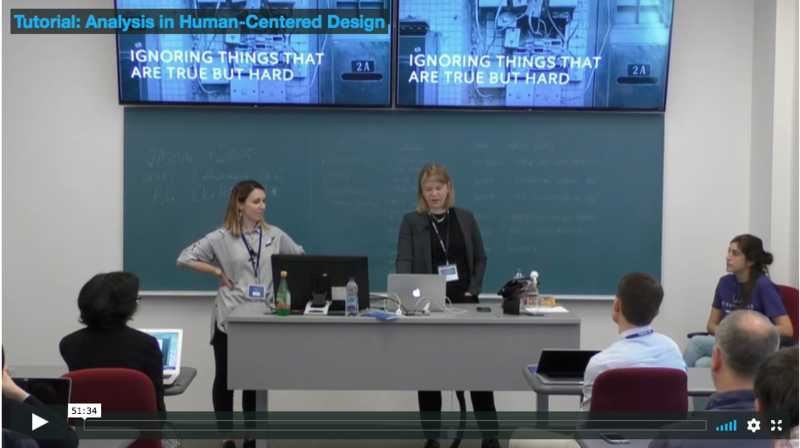 in Industrial and Interaction Design from Syracuse University. JoEllen Kames is a portfolio lead for the Client and Partner Experience Studio at Northern Trust. She explores “what is,” “what could be,” and “what if” in the context of research, design and innovation. Prior to joining Northern Trust, she led research for wearables and the Internet of things at Motorola Mobility, a division of Google and led design research for the Innovation Center of Excellence at United Healthcare. JoEllen has a BA in History and Philosophy from the University of Illinois Urbana Champaign, a BFA in Communication Design from University of Illinois Chicago and an MDes from the Institute of Design. Illinois Institute of Technology. She guest teaches design research and interaction design at MIT.